Renew your trampoline with this Skywalker Trampolines spring pad. 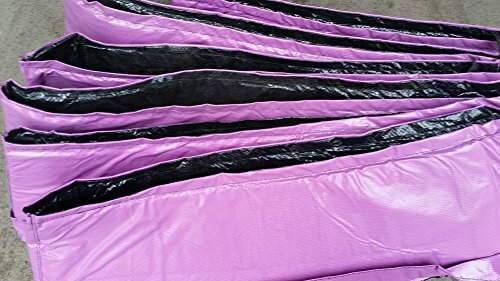 The Skywalker Trampolines 12' Round Replacement Spring Pad, Purple, is made of high quality weather and UV resistant PVC material and is designed to cover your trampoline frame and springs for protection. The pad is specifically designed to fit around the 6 enclosure poles of a 12' Skywalker Trampoline, offering the best quality and fit for your Skywalker Trampoline. Product Details: Skywalker Trampolines 12' Round Replacement Spring Pad, Purple. Genuine Skywalker Trampolines component. Weather and UV resistant high quality PVC spring pad. Very Strong and High Quality Purple Safety Pad with 310g PVC on top, 130g PE on bottom and 1/2" foam thickness EPE. High Quality, shock absorbent, high density, closed-cell foam that will not absorb water, mildew or lose shape. Fits very neat on the trampoline. Double rubber ties for better protection and holds up tightly to the trampoline frame. UV resistant, Anti-fungal/bacterial, Cold weather crack-resistant coating. Fits all brands with frame size of 12 FT. Trampoline takes 72-V-rings. Fits Skywalker Trampolines models SWTC1200, SWTC1211, SWTC1213, SWTC1214, ATC12B, ATC12R, ATC12G,STEC12G, STEC12B, STEC12P, STEC12R.